Prolific is certainly the right adjective to describe the literary output of Canadian author Norm Foster. For the second or maybe third time, this paper has had critiques of two different plays appear on our front page. This time, it’s ‘Looking’, and “OLD LOVE”. Authors are supposed to write about things they know or have experienced. Foster ain’t old; he’s barely sixty. That’s just upper middle age! The plot line deals with a couple who first meet briefly when Bud has just started working for Molly’s husband. A couple more incidental encounters, then a two decade hiatus until her husband’s funeral. He’s divorced, financially successful and still possesses an enduring regard and desire for the new widow. She’s neither ready nor interested. He’s in for the long haul, hence the title. Act of Faith Production’s director Dia Frid has opted to stage Old Love using just two super talented actors – Kitty Varley & Vince Carlin. She has about a half-dozen roles, he has only two but Carlin also must soliloquize with the audience. 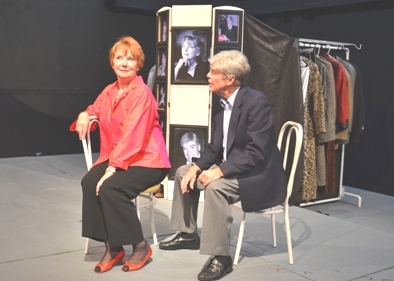 Frid’s set is two clothes racks and a couple of chairs; the rest is the protagonists. Sounds bland but her pacing; the extremely clever dialogue and the innately comedic sense of timing by her charges, make the necessity for a fancy set superfluous. The directorial blocking, minor costume changes and creative focal points all contribute to make this a fast-moving and attention-keeping gem. The pantomiming scene early in Act II is absolutely fascinating and should earn Varley & Frid some community theatre awards. Carlin, as usual, is as professional as it gets. He’s a talented enough thespian to help carry a two or three cast vehicle (think GIN GAME, ART etc.). In Old Love, the evolution of his character is an intrinsic part of the play’s raison d’étre and his Bud persona grows and matures in a compelling and credible way. The play itself is slick and there are lines of dialogue that this writer had a few impressions of ‘wish I had written that’ reactions… the type of repartee that quick-thinking and clever individuals might indulge. In my case, usually a few minutes too late!